We’ve spent the last two months drinking margarita after margarita (hard life), sampling options both frozen and on the rocks, flavored and purely limy, Cadillac and Tommy’s alike. We had basic criteria — the drink didn’t have to follow a “standard” margarita recipe, but had to use a citrus, probably lime, plus mezcal or tequila (and the bartender had to not correct you that “Actually, tequila is a kind of mezcal”) — but were open to out-there interpretations like the Pool Lounge’s drink that uses cumin syrup and carrot juice alongside tequila and lime. Here, the city’s absolute best margaritas. The context for a margarita is important. They just feel different in a self-serious bar: Maybe it’s perfectly shaken, double-strained over fresh Kold-Draft ice, and uses only the freshest lime juice, squeezed that day. 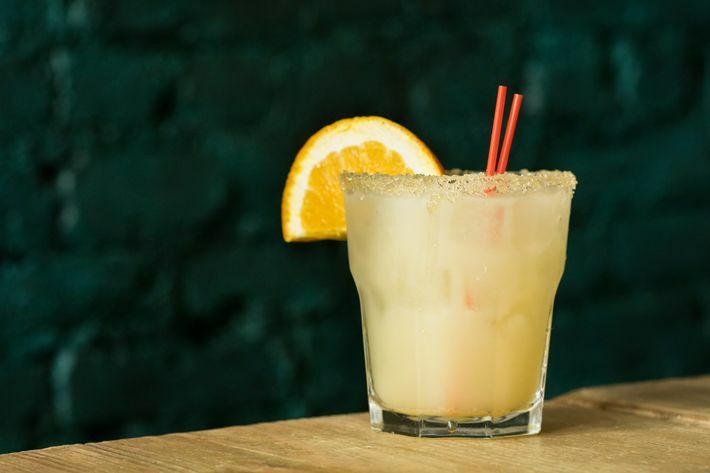 But a margarita should be served in a happy, joyous atmosphere, ideally with tacos, and as the name indicates, Calabrije’s has two of those things in spades. And though it’s not in the name, the atmosphere is great: fun, playful, and exciting, with décor that’s kind of like a tourist’s dream of Mexico — but the bar is run by three friends from Monterrey in Nuevo León. The menu, too, could incite skepticism (there are 21 flavors, more “than the rainbow has colors!”), but don’t doubt the place. 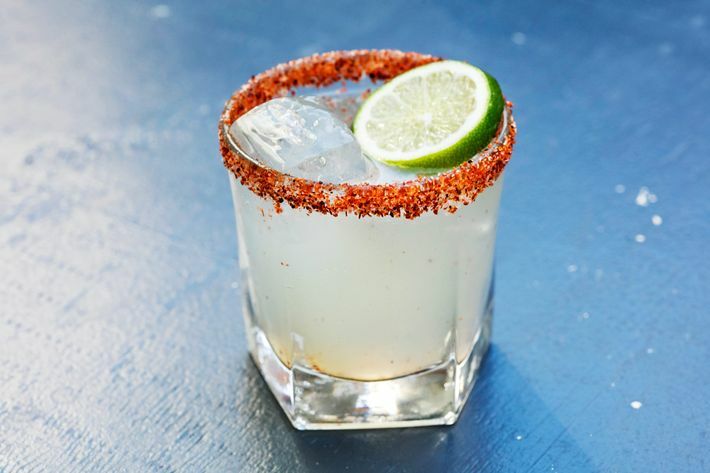 The super-friendly bartenders mix up terrific margaritas with fresh lime and agave, served over fresh ice in a pint glass (be careful with a second), with a spicy Tajín rim and a lime wedge. We like the jalapeño, which is spicy and garnished additionally with a slice of fresh pepper. P.S. : On Fridays, all the margaritas cost just seven bucks. Order the “Carlota’s margarita” at Atla and you might be offered a warning: This is not the drink you’re probably expecting. That’s because the bar staff adds to the tequila (Casa Dragones) two kinds of vermouth (Cocchi Americano and Dolin Blanc) and, crucially, lime curd, which all lends it a near-sweet creaminess. It’s terrific. But you’d do yourself a favor to order the Overproof margarita, too, which uses the 55 percent ABV Tapatio 110 along with Combier and triple sec. It’s much more aggressive than the first drink, and more acidic and biting, too. So it’s fun to put one in each hand and switch sip for sip, pausing only occasionally to fix yourself a bite of guacamole. The bartenders at this uptown Mexican restaurant blend their marg with the clean, bright Pueblo Viejo blanco tequila, lime, and agave, a standard Tommy’s margarita (a Cadillac would have triple sec, Cointreau, or the like). It’s long shaken and served almost frothy and a pale yellow-white because of that; it comes in a rocks glass heavily salted along half of the rim. 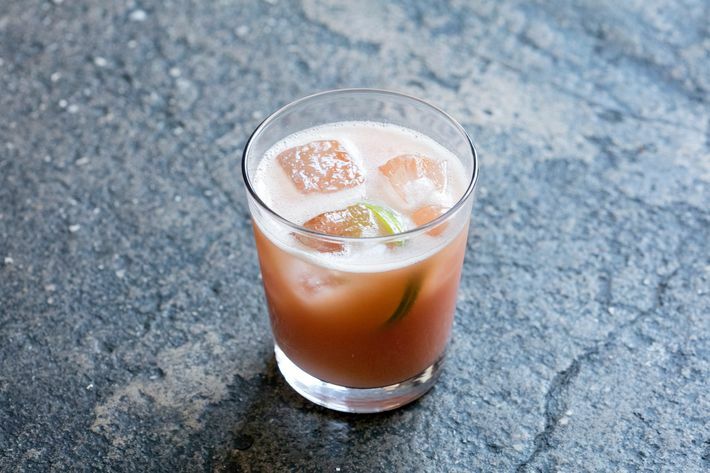 We love this drink for its simplicity and terrific execution, but favor the Diosa de Guava, which adds to that basic recipe both a healthy squeeze of guava purée and cilantro, making it a pretty pink, a little more complex, and sweeter, but not syrupy. Purists might decline to admit that it’s a margarita, but cocktail enthusiasts and anyone with taste buds will love the virtuous-seeming Carrot “margarita” served in the luxe-cool lounge at the Seagram Building. 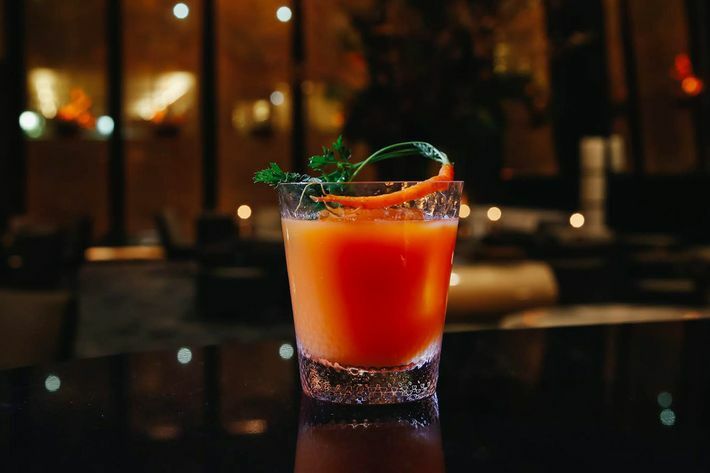 An earthy and smooth but subtle blend of carrot eau de vie, a reposado tequila plus a bit of mezcal, lime, carrot juice, and, brilliantly, cumin syrup, the drink is garnished prettily with tiny carrots that sit atop one extra-large cube of ice. At $20, it’s certainly not cheap, but the craftsmanship makes it a much better value than the $15 margaritas you can order at any number of anonymous restaurants nearby. The ¿Porque No? has been one of Empellón’s most popular cocktails since the first location opened in the West Village in 2011. And we love the atmosphere at this laid-back but raucous taqueria. Plop down into two seats at the bar and ask for two of those drinks (plus a couple of tacos; we like the cheeseburger and the al pastor). The efficient bartenders will turn out your cocktails in a matter of seconds, which is good because you’ll want to order a second as soon as you take a sip: The blend of Azteca Azul blanco tequila with cilantro and pineapple is tangy and juicy, the fresh-pineapple garnish is a pretty, delicious touch, and the serrano chilies add heat and a touch of smokiness. 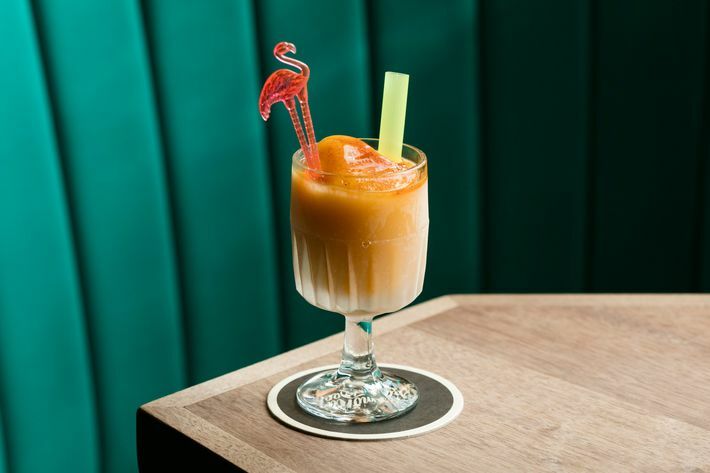 The juicy, playful No Pants Dance, served on draft — i.e., super quickly, even when the bar’s packed — builds on a basic marg (blanco tequila, lime, agave) and adds a caramelly, sweet, citrusy flavor with pineapple juice. That fruit’s taste dominates the drink, and it’s pleasant to drink just that, but a chili rim adds electrifying heat and makes the cocktail especially great. There is no mention of a margarita to be found on the menu at this Carroll Gardens spot, which is co-owned by bar legend Julie Reiner. (It’s right across the street from her consistently great Clover Club.) Ivy Mix, Reiner’s partner, makes inventive and delicious cocktails that favor pisco and sherry and rum, but also a veritable trade wind of citrus oils, dried guajillos, and tropical notes like macadamia, which renders down into the housemade orgeat. Mix’s spec for the house margarita keeps things basic: Arette Blanco Tequila, equal parts Cointreau and lime juice, and a dash of simple syrup to rein in any lingering sourness. It’s a perfect way to start a night, as a cornerstone to more cocktails, or to pair with anything off Sue Torres’s menu. In 2009, when the cozy West Village restaurant opened, the lone margarita on offer was made with jalapeño-infused tequila and was sweetened with agave. That chile-flavored cocktail is still on the drinks list, but it gets second billing to the no-frills classic. In addition to offering the “traditional” at a discount during the rollicking happy hour, Ofrenda gets two crucial things right: Its pitchers are jumbo — the drink loses none of its stiffness in the resize — and the bar readily offers more fancy flavored versions of the drink (mango, pineapple, cucumber) at a $1 markup. —H.M. Out of the slushy machine comes the Spicy Canary, a twist on the bar’s earlier cocktail the Spicy Flamingo. This one uses Milagro silver tequila, plenty of mango purée, chili purée, and lime, plus Tajín dusted on top next to the plastic-flamingo garnish. Drink the sunset-orange concoction with a bubble-tea straw — get water, too, because it’s spicy — in the sunny, spacious backyard. The city’s oldest continuously running Mexican restaurant debuted in 1959, which was when Charlton Heston flexed his Crisco-greased biceps in Ben-Hur, Berry Gordy had his first hit record with “Money (That’s What I Want),” and Disneyland finally got its futuristic monorail. In 1972, New York lamented El Parador’s hard-to-find front door, but otherwise praised the cactus salads and so-called “haunt of Beautiful People.” Margaritas cost $3 by 1972, and the strong, entry-level model now retails for $10. It is well worth every penny, not just for a chance to sit in the árbol-chile-red dining room and soak in some history. Get a side of the peanut-butter-stuffed jalapeños for good measure. —H.M. Two ambitious Mexican restaurants opened in 1984. One was the cheeky Caliente Cab Co., which later informed the gaudy Señor Swanky’s and arguably paved the way for so many balloon hats and unbridled cries of “shots, shots, shots, shots, shots” at tilde-d fever dream Señor Frog’s. Across town, Rosa Mexicano opened with a mission statement of introducing tinga de res to New Yorkers and making the dining world a little less safe for Tex-Mex. It’s tough to tell who prevailed: Rosa’s Slurpee machine constantly dispenses frozen pomegranate margaritas that routinely top best-of lists, but its “tradicional” unfrozen version is consistently strong, slightly sweet, and on the rocks, not to mention underrated in its own right. —H.M. “This is something that, when done without thought, is often done poorly.” That’s a warning from Dale DeGroff, the inimitable and influential bar titan, on the seldom-discussed topic of salt rims. The idea is that a good margarita shouldn’t have a heavy application, because flakes tend to trickle down into the drink. Nor should the glass wear an intact halo of the stuff, because few people want to brace for saline with every sip. The rocks glass at Enrique Olvera’s Flatiron restaurant is a little taller than most, so there’s more drink, and it comes with an incomplete rim — Leyenda, above, takes this seriously as well. The tequila is Cimarrón, which is boutique-y and fermented with proprietary yeast and befits the Michelin-starred chef. The recipe also eschews Grand Marnier and Cointreau for Combier, the original triple sec, made with bitter West Indies oranges in the scenic Loire Valley since 1834. —H.M. Longtime neighborhood stalwart Barrio Chino has all the benefits of its age — namely for our purposes, skilled bartenders who learn your name quickly, engage in friendly conversation, and can turn out a terrific margarita in under 30 seconds, the pours and shaking done by rote memory. (They make hundreds per night.) Order the spicy jalapeño, with bits of pepper mingling in the drink with ice and tequila and fresh lime; the grapefruit (pictured) is also a frequently ordered choice. A superclean, bright option with a tiny bit of agave sweetness from this great Prospect Heights Mexican restaurant and its sister bar. There are flavored varieties, but opt for the basic, which is satisfyingly simple.